Eddie Wales, owner of Motor Supply, has been active in the Columbia, S.C. hospitality and green-business scenes for years; far before he purchased ownership of the restaurant in 2000. Born in N.C., Eddie grew up in Spartanburg, S.C. and went on to attend the University of South Carolina here in Columbia, during which he worked in numerous restaurants, clubs and hotels. Always drawn to the food and beverage industry, Eddie was led to Motor Supply by a friend in 1989. He began waiting tables at Motor, working his way up the ladder to become General Manager two years later. In 1994, Eddie left Motor Supply and moved with his then-fiancé, now wife, Tracy, to Athens, Ga., where she attended veterinary school. While in Athens, Eddie worked for the talented restaurateur Melissa Clegg of The Last Resort Grill, and later helped Clegg open East West Bistro in 1996. The couple returned to Columbia after Tracy’s graduation and Eddie eagerly returned to his position at Motor, only to purchase the restaurant in 2000. Placing a priority on green business practices and contemporary Southern hospitality, Eddie leads a staff of equally passionate professionals who go above and beyond to provide Motor Supply’s customers with the best dining experience possible. "We're blessed to have eco-conscious staff,” says Eddie. "Owning a green business in Columbia is great – you can feel the enthusiasm for sustainable projects radiating from City Hall and even from the S.C. State House.” Recent Motor staff green initiatives have included vegetable scrap composting and an organic herb plot at USC's Green Quad community garden. "Being green has been such an easy choice for us,” notes Wales. “It's just right in line with what Wes is doing with the food; buying from local, sustainable farmers." 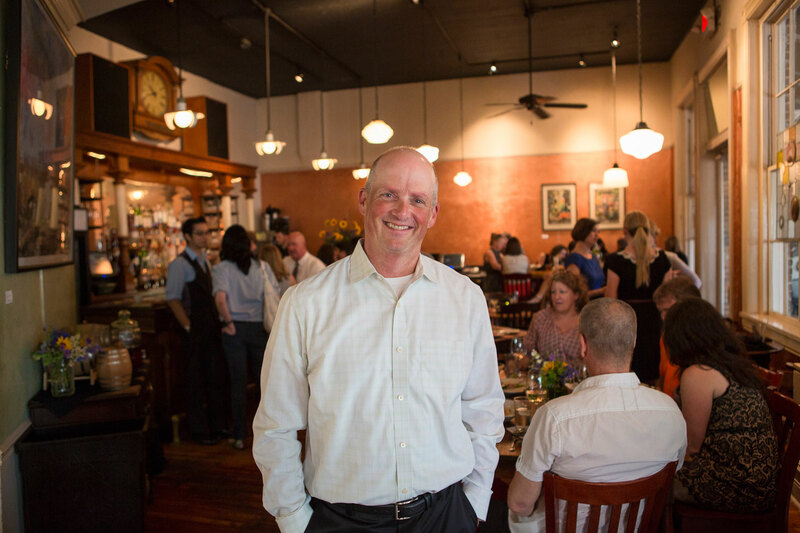 Eddie enjoys giving back to the community and serving on the boards of the Congaree Vista Guild and the Forest Acres Restaurant and Merchant Association, which he founded in 2004. Eddie’s other culinary conquests include opening and owning Motor Supply’s sister restaurant Tombo Grille until 2011, co-launching Columbia’s Rooftop Rhythms concert series in the mid-2000s, and from 2006 to 2008, owning the popular Paulie’s Pizzeria in Forest Acres. In his spare time, Eddie can be found in his backyard garden, teaching his three daughters how to grow heirloom tomatoes (Palmetto Tasty Tomato Festival Best Homegrown Tomato 2010 prize-winners) and spending time with his wife Tracy, owner of Four Paws Animal Clinic in Forest Acres.